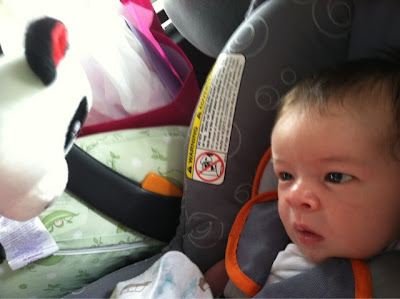 We have all heard that small children sometimes (well, often) do not like being in the car. Sure, some babies love it. Some even need a car ride to fall asleep. Well, I try to go for the prepare for the worst, but hope for the best motto. I planned to have a baby that hated the car. My plan would kill two birds with one stone. 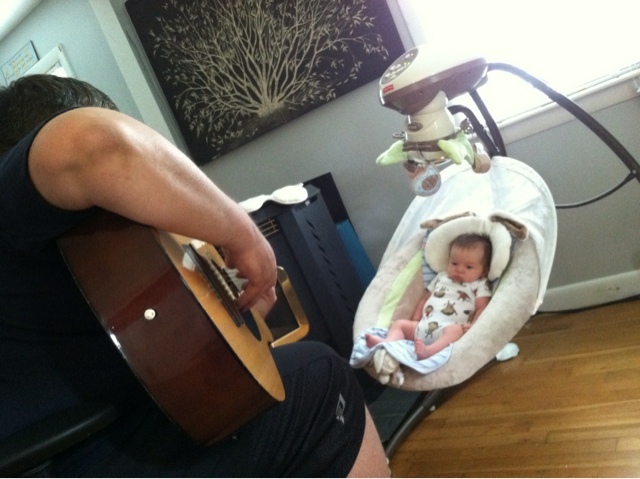 First, my baby would love his/her daddy's music before even entering the world. Second, mommy would have a sneaky way to calm down a crying baby in the car. Once I knew that my baby was starting to hear sounds well, while still pregnant, I started playing Sean's music in the car. Every day on my ride home from work, I would listen to one of Sean's CDs in the car. This lasted for months. Your baby will get used to the music, and know it well. Important note: If you are going to try this, please be sure that you select music that will not drive you mad after hearing the same song 1,000,000 times (thank God I love my husband's music). The wrong choice could drive you mentally insane. Sometimes I need a shower or to eat, and Max wants me to cuddle with him anyway (which I LOVE by the way). To avoid my husband wearing a gas mask because I smell so bad, I need to shower somewhat regularly. To calm Max down while I shower, Sean will play his guitar and sing for Max. He quiets right down, and stares at his daddy while listening intently. He loves it! I'm positive he would love it even if I hadn't predisposed him to it, but it's worth noting anyway. Now, one of the worst feelings in the world is driving in a car alone with a crying (ie: screaming at the top of their lungs) baby. This brings new parents to tears. Maybe even panic attacks. I'm lucky. Once Max starts to fuss, I can pop one of Sean's CDs in and TA-DA! Instantly calm baby! All of those hours of listening to my husband's music in the car has really helped me in the long run. Plus, it didn't hurt that each time I do this I fall more in love with him. That's a positive too, right? Sean and I have taken Max on a few car rides together. The poor little guy would cry and cry, even if mommy was sitting in the back with him. We tried talk radio, music, talking to him, shushing, etc. Nothing really worked. Nothing like this at least! An example, to prove that he loves this music. Yesterday I was driving to the allergist's office, and I figured I would push my luck and listen to the radio. I was listening to WBRU, to some light rock type stuff. Well Max did not like that at all, he got all fussy. I switched on his daddy's music, and he calmed right down. My nerves calmed down too, and it was a great ride. Side note: Max starts crying again if mommy sings along to daddy's music. I knew that my singing voice wasn't in my "pros" column, but Max clarified that it definitely deserves to be in my "cons" column. Thanks, Max. I needed the reality check. I will leave the singing to daddy.